East Cork Municipality has set aside almost €2million to improve roads in the area. A further €110,000 has been earmarked for footpath restoration throughout the borough. Areas set to benefit from the cash include Ballycotton, Ballinacurra, Youghal, Midleton, Dungourney and Cloyne. The investment comes after some motorists described stretches of East Cork roads akin to the crater of the moon, they are so potholed. 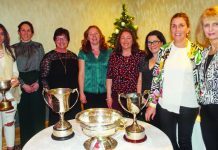 Seandun Macra To Celebrate 60 Solid Years in Existence!